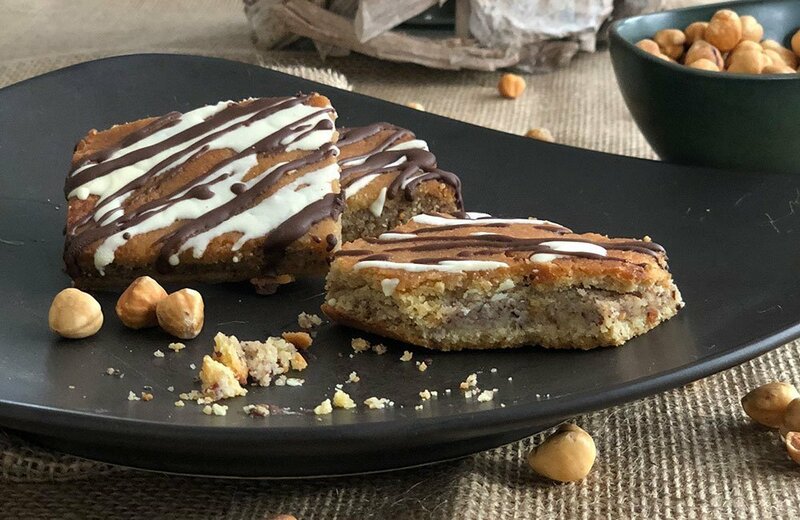 Slices made of shortpastry and juicy hazelnut filling with a delicious caramel crust. JUST 1g net carbs per piece! 50 g Dr. Almond Chocolate Magic DARK CHOCOLATE (or other type of chocolate). You could also use 2 different types! Mix Cake Magic, Almond Powder and eggs. Melt the butter, stir in and refrigerate the batter for approx. 1 hour. Stir Hazelnut Ready Mix with milk and melted butter and let stand for a short while. Roll the shortpastry dough on baking paper approx. to the size of the sheet, use some bamboo fibre for flouring, if it’s too sticky. Cut the dough in the middle with a knife and spread lower half of the rolled-out dough with the hazelnut filling. Then fold top half of the dough over the filling and press well down. Cook in an oven preheated to 175° C (fan-assisted) for 25 minutes or for 30 minutes using top and bottom heat. This entry was posted in All Recipes, Cake and Muffins, Sweet Recipes. Bookmark the permalink.